I want to dedicate today’s blog post to a little virus known as Hepatitis C virus. Having worked on HIV before, and now moving onto work with HCV, I am tempted to compare the history of these two viruses and I find a lot of parallels. Both viruses were discovered in the 80s (1983 and 1989, for HIV and HCV, respectively), they can both have a long incubation period, and they both infect a whole lot of people worldwide. Of course there are many differences as well. For one, HIV comes with a 100% mortality rate. HCV doesn’t get integrated into the human genome and about 25% of people infected can clear the virus on their own. The remaining 75% of the HCV-infected individuals remain at the mercy of the current anti-HCV treatment (20-80 % of them can expect to be cured, depending on the infecting HCV genotype). It is in fact the available treatment options that most set HIV and HCV apart. Today, an HIV-positive person living in the first world can chose from an array of over 25 antiretroviral compounds. The development of these drugs has been the fruit of over 20 years of aggressive research, supported by grass-root activism and heavy funding from both government and industry. It has also been aided along the way with the development of appropriate animal models, cell-culture systems, and in vitro enzymatic assays that corresponded well with patient outcomes. In contrast, anti-HCV antiviral development has been very slow. For one, cell-culture growth of the virus (or the related replicon model) was not possible as recently as the mid-2000s. Developing in vitro systems for the study of HCV proteins have not always been straight forward either. Despite these many hurdles, anti-HCV drug development researchers have not given up. In fact, we are at the beginning of an exciting era. Last year saw the FDA approval of two new protease inhibitors for HCV. Gilead recently made an 11 billion dollar purchase of a small pharmaceutical company called Pharmasset which possessed an anti-HCV compound showing 100% cure rate in recent phase 2 clinical trials. Many different pharmaceuticals are also in possession of a number of very promising leads and are competing for the eventual market. Putting all recent finding together, one is tempted to speculate that this decade is the beginning of the end for hepatitis C.
In this blog post, I would like to focus on one of the major antiviral targets, namely NS5B, the viral RNA-dependent RNA-polymerase, which is essential for replication viral genomic RNA. I would like to focus on some of the issues that the field has faced when it comes to assessing NS5B activity in vitro and some new findings that will impact anti-NS5B drug development. As the viral polymerase, the NS5B protein is a major target for therapy. Both nucleoside analogues and non-nucleoside analogues are in development for inhibiting this protein (namely, the 11 billion dollar investment by Gilead was for a nucleoside analogue called GS-7977). But working with the NS5B enzyme has proven to be a challenge and may in part account for some of the delay that the field has seen in drug development. Almost all publications to date (dating back to mid 1990s) report an in vitro activity of below 1% to 5% for this enzyme. This low activity is what makes working with this enzyme so difficult and this is why I was very excited to read a February 2012 publication in the Journal of Biological Chemistry (Jin et al. 2012) that claimed that with some minor protocol changes, the in vitro activity of the enzyme can be increased to 65%!! But lets take a step back for a moment and examine some of the rationales that were previously proposed to explain this low level of activity. There are almost 100 crystal structures available for NS5B and a recent April 2012 publication in Journal of Virology even shows the protein bound to the RNA substrate (Mosley et al 2012). A close inspection of these structures revealed an intriguing property for this enzyme. 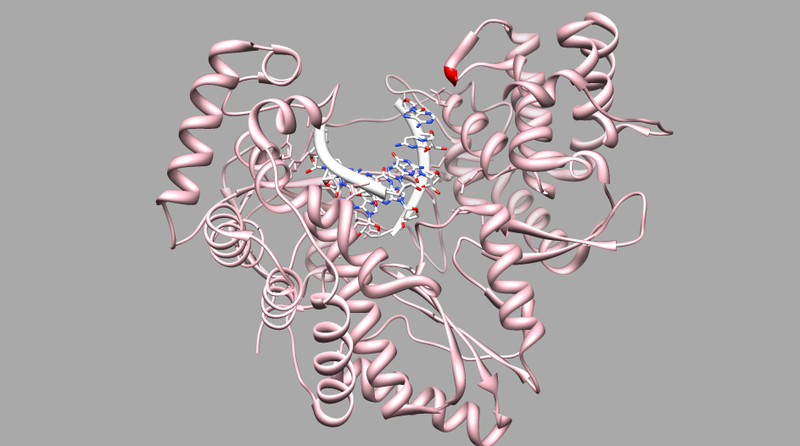 It appears that near the C-terminus of NS5B, there exists a beta-hairpin loop that folds right into the active site (see Figure 1, the loop is highlighted in red). It is suggested that the presence of this loop in the active site, prevents the double stranded RNA/RNA substrate from binding, and if no RNA is bound, no activity can be had! Some have gone on to call this loop the “auto-inhibitory” beta-hairpin loop. This was supported by the recent crystal structure, where the beta-hairpin loop was taken out and replaced by two glycine residues and lo and behold! A 100-fold increase in activity was observed! The absence of the loop also allowed for the co-crystalization of NS5B with its RNA substrate (Figure 2). Figure 1.Crystal structure of NS5B genotype 1b. 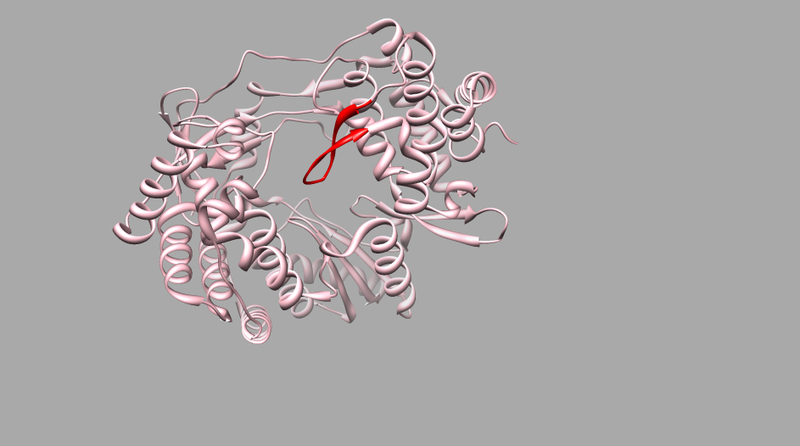 The enzyme is shown in pink. The beta-hairpin loop is highlighted in red (Bressanelli et al 1999). Figure 2. Crystal structure of NS5B Genotype 2a. The enzyme is shown in pink. The glycine residues replacing the beta-hairpin loop are shown in red. The co-crystalized RNA/RNA substrate is shown bound to the active site. Of course, all of this begs the question why would a naturally occurring part of the enzyme, prevent the very activity that it is supposed to do? No one really knows the answer yet, but it is speculated that this loop serves some sort of a regulatory function, especially relevant in vivo where other host and viral proteins are present and impact viral replication. The issue is that we really have very little information on how NS5B interacts with itself and other proteins in the context of replication. But I digress! Of course synthetically taking out a structural loop of the enzyme can be an immediate solution to the problem of low enzyme activity. But this also raises questions about the in vivo relevance of such a model. And this is what makes the Jin et al 2012 publication exciting. Their findings indirectly corroborate previous findings arguing that the rate-limiting step in in vitro activity is the slow binding of the enzyme to the RNA substrate. Based on this, they show that it is not necessary to further modify the enzyme, but rather just give the enzyme more time to achieve what it needs to achieve. They show that 24 hour pre-incubation of the enzyme, with the RNA substrate, with the addition of a few starting nucleotides, gives the enzyme enough time to form active elongation complexes. Under these modified conditions, they found that 65% of the enzyme was capable of forming elongation complexes, which in turn could incorporate nucleotides as good as the next polymerase! If the findings in this publication are repeated and confirmed, I am sure that many NS5B enzymologists will take a breath of relief. With the projection that the GS-7977 compound will be the next compound to get FDA approval, we are looking at many years of nucleoside analogue therapy for individuals infected with HCV. As treatment usage increases, we expect to see more drug resistance, which will bring us back to the drawing board for the development of next-generation nucleoside analogues. Therefore, any knowledge we gain now about the functions of NS5B in vitro will surely help us better prepare for the future. As the development of GS-7977 will likely represent a turning point in HCV therapy history, I am hopeful that the two publications highlighted here will come to represent a turning point for in vitro studies of the HCV polymerase.